RCQ’s Installation Dinner held on 23 June 2012 at Tanglin Club was a great success. RCQ members were honoured to have Mr Massimiliano Sponzilli, Italian Trade Commissioner, as their Guest of Honour and to welcome family & friends for that event. In her speech outgoing President Mavis recapped the past year. Furthermore, President Mavis thanked the outgoing Board of Directors for their work and handed over the President’s jewellery to Incoming President Chee who later presented in his speech his ideas for the new Rotary Year. Many thanks to Outgoing President Mavis and congratulations to Incoming President Chee! A slideshow with photos taken in Rotary Year 2011-2012 was running during the entire evening and reminded members of the projects & fellowship events. For the sake of entertainment, Rtn Getty had organised an artistic dancing performance. Rtn Francis did a great job as the MC. 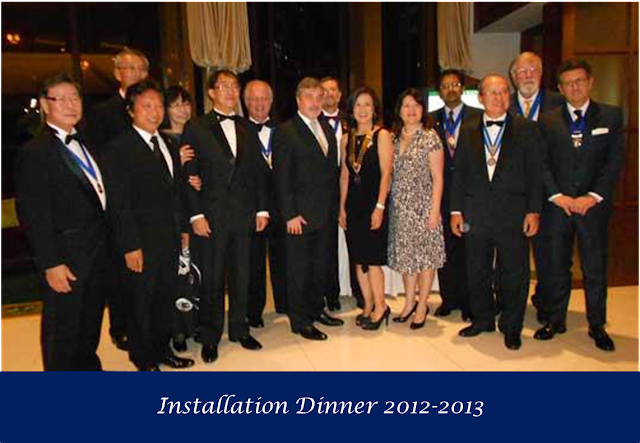 By the way, photos taken during the Installation Dinner will be uploaded to the RCQ Photo Album.